If you’re looking for the perfect gift to pamper Mom under $100, you’ve come to the right place. This selection includes nine perfect Mother’s day gifts to pamper your mom with some good living. Good living?, you may ask. Yes, you read right. The French use the expression “bon vivant” to refer to those who enjoy the good things in life. With this idea in mind, we’ve scoured some of the finest items under $100 that will surprise Mom with something exclusively picked for her, that she will not need to share with anybody else. 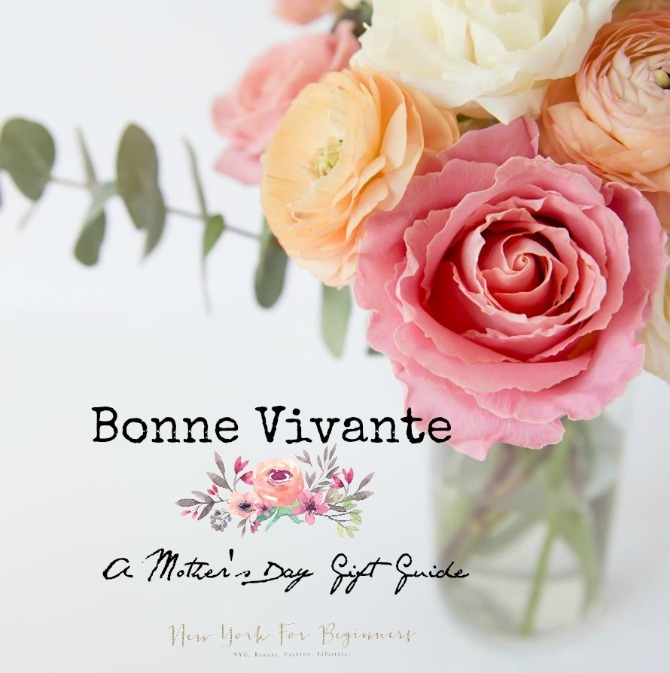 Are you ready to join our bonnes vivantes club? 1. Ashton sweatshirt by Happiest Tee (regularly $118, get 30% off with code VIP30): What if I told you that it’s possible to wear a hug? That’s what this super soft sweatshirt feels like. Made with love in the USA with the airiest modal terry and a teensy bit of Spandex, it has the property of enhancing every single body shape. It literally sits like a glove, adapting to every single contour! Plus, the adorable rose gold script that reads “Happiest in Love” will be a reminder for Mom that all the love she has given you is returned tenfold. This is a memorable gift that will make her think of you every time she sports this sweatshirt. Fashionable, comfortable, lightweight, and unique, this Happiest in Love sweatshirt surely celebrates the finest things in life! Made in the USA. 2. Crystal Love Bath Salts by Crystal Hills Organics ($44): Finding the finest bath salts is a complicated task, especially because there has been an explosion of low-quality and synthetic products. Crystal Hills Organics is one of those few companies that do things right and use the finest ingredients in their formulas. Designed to rejuvenate body and mind, these Crystal Love Bath Salts have the purifying and rejuvenating properties of five types of salt mixed with the balancing properties of real pink quartz crystals. Plus, their high content in botanical ingredients such as rose blossoms, rooibos, hibiscus, and firewood make taking a bath a memorable experience. With just a whiff of their intoxicating, sensual scent, I personally feel transported to a good place, no matter how hectic my day has been. If you really want Mom to experience the finest things in life, these decadently rich bath salts are a perfect gift that screams ‘Give Yourself Permission to Enjoy a Break!’ Made in the USA. This is a 100% natural product with organic ingredients. 3. Refreshing Pitanga Gift Set by Natura Brasil ($50): Who said that traveling is too expensive? Give Mom the gift of discovering some of the best-kept secrets in the Amazon basin with this wonderful gift set. Natura Brasil is an eco-conscious beauty brand that has just opened its first online store in the USA. With carefully blended formulas using some of the most incredible natural active principles originating in Brazil, Natura Brasil uses the force of beauty for good with its sustainable and fair-trade products. The Pitanga line uses the crushed leaves of the Brazilian cherry to create a surprisingly refreshing experience. A $65 value, this gift set includes an Agua de Pitanga (a light body spray with mandarin and cassis notes), a Pitanga Whipped Body Mousse in a deluxe travel size, and a Pitanga Bath and Shower Gel in a deluxe travel size. This gift set is available at Natura Brasil’s flagship store in New York at 240 Elizabeth Street. 4. Organic Bamboo Leggings by Boody ($29.95): Comfort is the new luxury, and these leggings do a great job at keeping Mom cozy and stylish. Carefully manufactured using organic bamboo rayon, they are naturally moisture-wicking and double up as the most comfortable pair of tights under a skirt or a no-nonsense pair of yoga pants. Eco-friendly, non-toxic, and super breathable, these leggings also bear the stringent Oeko-Tex certification to ensure they are good for you, for the workers involved in its production, and for the environment. If you are looking at the finest things in life, comfort and style don’t have a price! To learn more about Boody and its organic bamboo rayon, click here to read my review of the brand. 5. Jewelry Box of Treasures by Kikkerland ($20): Did this Book of Treasures fool you too? Instead of describing a great story, it lets Mom build her own by curating and storing her most valuable trinkets in a safe place. Bound in PU black leather and a linen-lined interior, its magnetic clasp keeps Mom’s jewels safe. 6. Mimosa Handbag Set Essentials by Paris Honore ($59.40): If your Mom travels a lot, space is a commodity she can’t afford to waste. Why not give her the gift of the finest natural cosmetics that fit in the tightest carry-on baggage? This chemical-free hand sanitizer and hand lotion wonder-filled duo is packed with organic ingredients to achieve great results even in travel-friendly sizes. Plus, this gift is like a brunch in a bottle; perfumed with the delicate scent of mimosa, it delivers a relaxing experience, no matter how hectic the airport. Sometimes the finest things in life come in the form of pure, natural ingredients, and this gift set by Paris Honore is the definition of a Bonne Vivante’s perfect beauty accessory. Made in the USA. This is a 100% natural product with organic ingredients. 7. Cupcake Bath Bomb by Arianna Skincare ($19.99): A bit of me-time is the greatest gift you can give to Mom. If she’s the foodie type, she’ll love this special blend of natural ingredients in the shape of the most delicate and luxurious cupcake bath bomb. Extremely moisturizing and with a delightful smell, its formula is designed to slowly release some seriously relaxing natural butters and oils to make a memorable experience. Individually wrapped in an adorable transparent box reminiscent of a bakery, it will be hard for Mom to decide when to use it. Pair it up with a good bottle of wine and she’ll be all set for a wonderful evening! 8. Crosshatch Zip Pouch by Verloop ($38): If your Mom loves DIY projects, she’ll surely appreciate this spirited spin-off of the traditional knit pouches. Soft, fashionable, and roomy enough for a smartphone or a tablet, this crosshatch zip pouch is lined with high-density nylon fabric to withstand the test of time. With its cute pom zipper, it doubles up as a cute handbag to compliment a little black dress, or even as a fashionable cosmetic pouch. The epitome of how the classical savoir faire can transition into a fashionable piece, this is the perfect gift for the discerning Mom who likes to rock an effortless look. 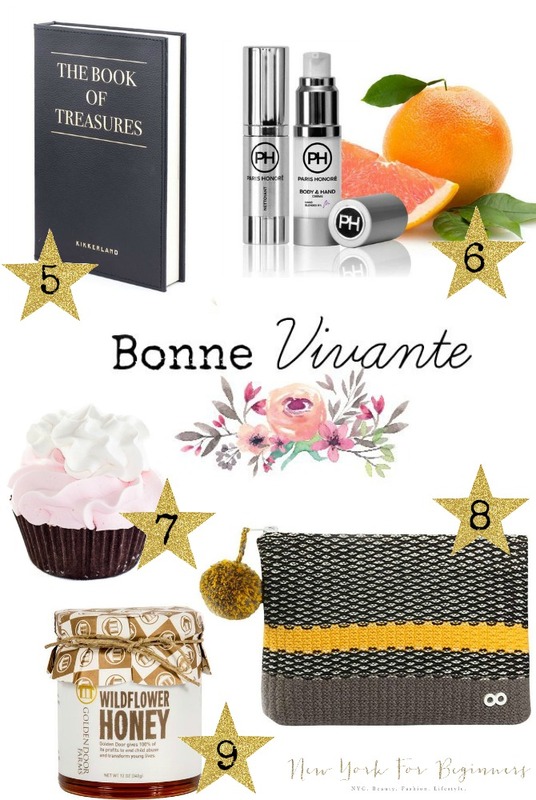 Plus, this is the perfect companion for the Mimosa Handbag Set curated by Paris Honore. See? We are already helping you become a bonne vivante by doing all the hard work for you! 9. Wildflower Honey by Golden Door Spa ($18): A good bonne vivante knows how to enjoy the finest things in life. In the era of globalization, it is often complicated to local, pure, and high-quality honey. This Wildflower Honey is carefully collected from the Golden Door hives in California, whose citrus groves are responsible for a very special aftertaste. Either as a companion to a very special breakfast or part of a beauty mask recipe, this organic honey is the perfect gift for those Moms who enjoy the simplest pleasures in life. Plus, if you are looking for a perfect gift that also gives back, look no further: Golden Door donates 100% of the proceedings to charities that help end child abuse. With this gift, you’ll make Mom’s life sweeter, and you’ll also be helping sustain the local ecosystem with thriving honey bees. Made in the USA. This is a 100% natural product with organic ingredients. My pleasure! I hope you found the perfect gift within your budget!